Spotify is rolling out its self-service ad platform, Ad Studio, in public beta mode in the UK and Canada. 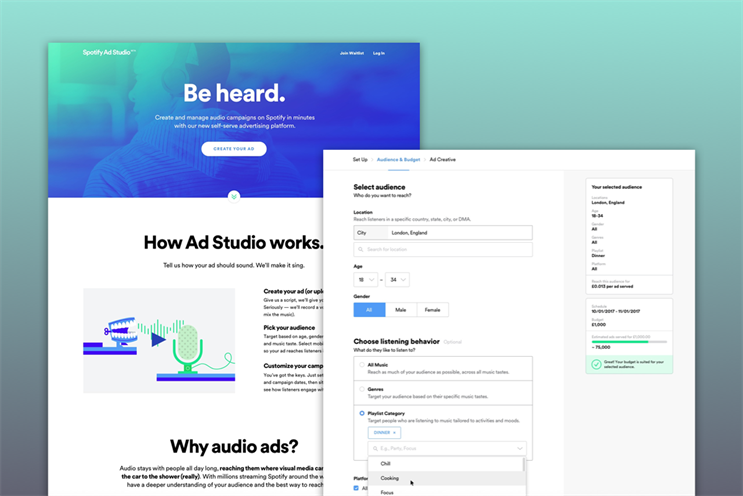 Spotify first launched ad studio in the US with the aim of making it easier for marketers to create audio ads on the platform. It promises advertisers targeting via a capability it calls "streaming intelligence". This means its Ad Studio targets not just based on age, gender and location but also genres and playlists. Advertisers can craft relevant messaging to reach the right people at the right moment based on the mood the music indicates. In the UK and Canada, Spotify has been working with launch partners in closed beta mode. To use it, marketers just have to share a script, pick a background track and will receive a fully-produced audio ad to review, complete with recorded voiceover at no extra cost. From there, marketers can pick their target audience, customise their budget and campaign dates, and track results. "Spotify Ad Studio lets us connect with listeners who are already engaged and plugged in," Mark Kovic, label director at Kovic Productions, a beta test partner in the UK, said. "On other platforms, you spend a lot of time trying to find an audience of music fans — on Spotify, they’re already listening."